My Disillusionment in Russia (1923) is Goldman's account of her experiences in Soviet Russia from 1920 to 1921 and what she saw as the Bolsheviks' betrayal of the revolution. 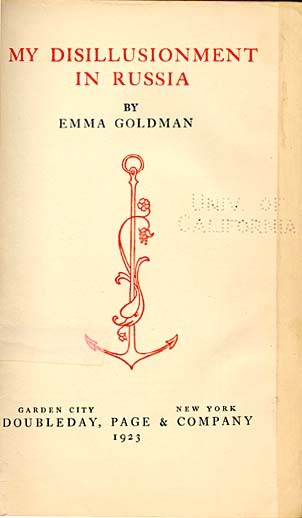 Goldman was dismayed when she discovered that Doubleday, Page & Company had, without informing her, replaced her title "My Two Years in Russia." Even worse, the publisher cut the last twelve chapters of the manuscript, omitting her account of crucial events such as the Kronstadt rebellion and an afterword in which she reflected on the trajectory of the revolution after the Bolsheviks seized power. 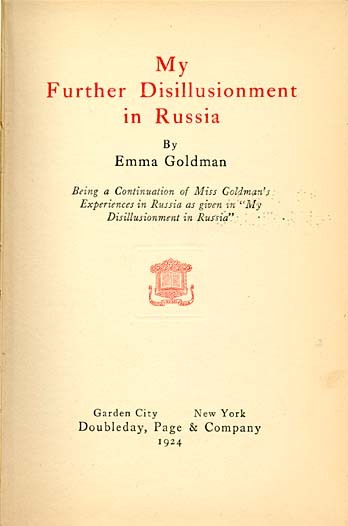 At Goldman's insistence, the publisher attempted to rectify the situation by publishing the omitted chapters as a separate volume: My Further Disillusionment in Russia (Garden City, N.Y.: Doubleday, Page & Company, 1924). The complete text in one volume, with an introduction by Rebecca West, appeared the following year: My Disillusionment in Russia (London: C. W. Daniel Company, 1925), and is the version from which the following selections are presented online.